Still could go either way. I’ve shown you sentiment charts, I’ve shown you the COT levels, the cycle analysis, Global QE and negative interest rates. Everything is confirming what I’ve been saying for months. But most retail investors are visually driven by charts. Now the charts (a lagging indicator) are confirming the same thing that all the other tools have already signaled. How much longer will you let your bias prevent you from seeing what is occurring? Well thanks for not deleting my comment. I suggest u take the 30 minutes and watch the vid with an open mind. You could be right but until a few weekly highs are printed, this still could be a bear market rally. The one chart that argues it is margin debt. It has rolled over and typically declines for many months. I can’t make money on the idea that this “might” be a bear market rally. I would have no idea where to initiate shorts (not that I would bother trying to short anyway. Seriously how many times do people have to get squashed by the Fed’s printing press before they learn their lesson?). And I would never short with the combined index COT level at +25 billion. I can go long based on all the evidence that I’ve given though. Hes wise enough to realize a good financial site accepts all comments pertinent to the site.. Including legitimate critical insight & questions…. and has now taken to publish other persons newsletters without introducing that author. That site sounds remarkably like Greedometer. The dude running it is guaranteeing a market crash, and has been for months. Then as it doesn’t he keeps sayings its because of all the central bank ‘sugar bombs.’ he’s a broken record and amazingly he gets major hedge funds or major fund managers to subscribe. If this is not a bear market rally, his followers are totally toast. Actually the market has been doing exactly what I’ve been predicting based on cycles and my anticipating PPT market interventions. All the way up I kept telling the perma bears like you not to short the market and that the Nasdaq would test the all-time highs. I even suggested it would make a marginal break above 5132 but would get no significant follow through above that level without a major correction first. Well we got the major correction, and all along I kept warning people not to short the market as it is just too difficult and one never knows when the PPT would intervene. I even warned subscribers on that Thursday Feb. 11 that the PPT would likely intervene and try to prevent the market from breaking through support at 1800. I nailed it perfectly. 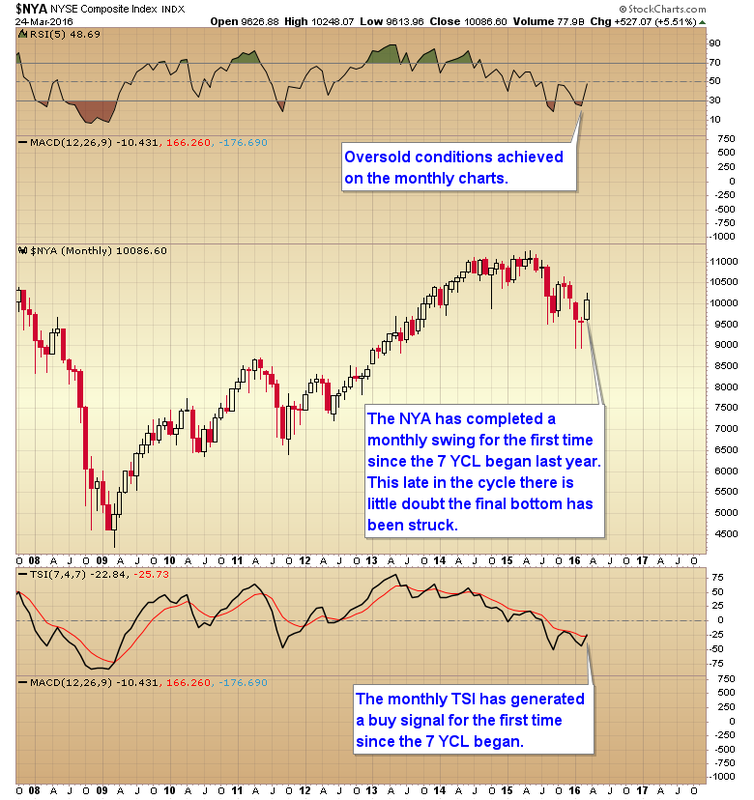 Now I’m about 85% convinced that the intervention signaled the final 7 year cycle low. The reason people subscribe to my newsletter is because I consistently make money, and I do it by using multiple tools (cycles, sentiment, COT reports, etc) instead of just emotionally following my bias. If that was the case then I would just short the market as I think it should continue the bear as well. But emotions rarely make one any money in this business. By the way the stock portfolio is up 25% during a time that the S&P is down. I did this during a period when stocks topped and moved down into the 7 YCL and and it was purely from long trades as I almost never sell short. Jezz, the markets include bonds are trillions in total value. You think a few hundred billion on the COT report can dictate directions? Pure newsletter scam. 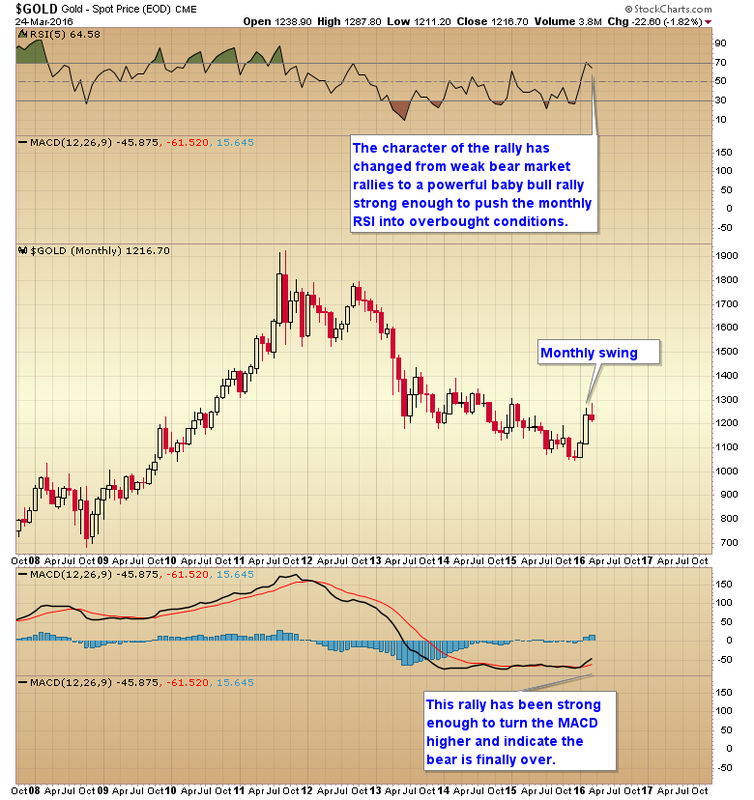 How did these COT work out for you in 2011-2013 during the gold/silver collapse. How many people did you ruin during those time? I’m guessing by your tone that you may have been caught up in the SLV Leaps fiasco. Frustrating, but Gary admitted he was wrong. Time to move on. We only had 6% in SLV LEAP’s.No one got “ruined”. Everyone misses trades from time to time, and that includes me. I certainly did not foresee that the metals would be attacked and taken down in 2013 to keep the commodity markets in check during QE3. But I did exit metals positions early in February of 2013 when it became apparent that there where forces suppressing gold. Once I started to expect the manipulation it became easier to avoid the attacks and we still made some money on the bear market rallies. Yes, but you and I know some probably bought much more. Stevie sounds like a disgruntled former Goldman employee. Own individual issues icyclicals. All charts look the same. A V bottom now trading above there 200 MA. Remiscent of 2009. Lucky to catch them when i did. Backtrsting in progress then up imho. Many/most positioned for 2007 redo… Not. Thanks. Nice review Gary. Apart from monthly implications, we still have DCLs immediately in front of us in stocks and oil, right? Yes we should have DCL’s ahead, but beware of the potential for a runaway move if they (the DCL’s) don’t start almost immediately Monday morning. Are you holding Miners ‘old turkey’? Or hoping for another shot at GOLD $1300 before you exit Miners..? I intend to hold Old Turkey if I can manage to stay disciplined. 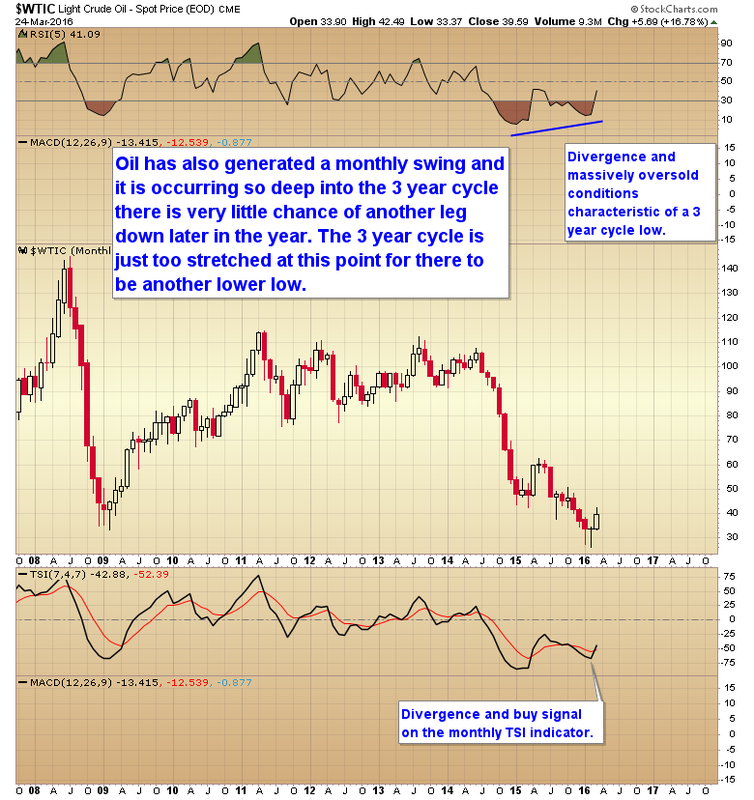 Or does it look like those DCLs in stocks and oil could be aborted? My thought at the moment is that the dollar is probably about to start another 6-7 year cyclical bear market. Corporate profits in full collapse mode. If fighting the central banks is a losing proposition, explain why Europe, US and Japan are all in 15-18 month down trends. right … stevie is now on my ignore list … his rude comment earlier was over the line! Again, you can’t throw a statement without backing it up with facts. If there’s no facts, it’s pure dog chit. If fighting the central banks is a losing proposition then why is Japan in a 30 year bear market? Why has Europe struggled for the past 15-16 months? 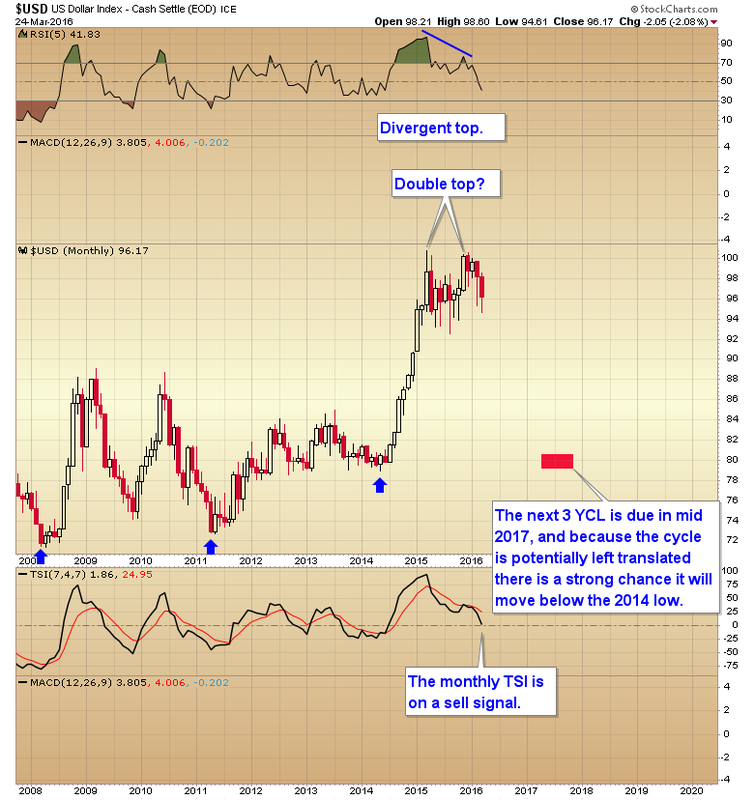 Stevie- one analyst who warned a few months prior to silver falling from 49. in 2011. Stevie sounds all jelly of the longs and their new found riches. All you have to do is find something to buy baby! That one is easy. QE stretched all markets too far above the long term mean. They needed to correct and go sideways so the long term averages could catch up to price. Can you add a biotech chart Gary ? Here is the long term weekly chart of biotech. As you can see the sector is massively oversold and has come back to test the long term mean. Now I know there will be the usual crowd pointing out that there is no confirmation of a turn. That is true, but in case you haven’t noticed I don’t wait for confirmations. By the time a market has confirmed a major turn you’ve already missed the move. I want to make money off the initial turn and rally, not sit on the sidelines and watch it go by (sound familiar, as in everyone who missed the 90% rally in miners waiting for confirmation). This is why I use different tools than the majority of other analysts. 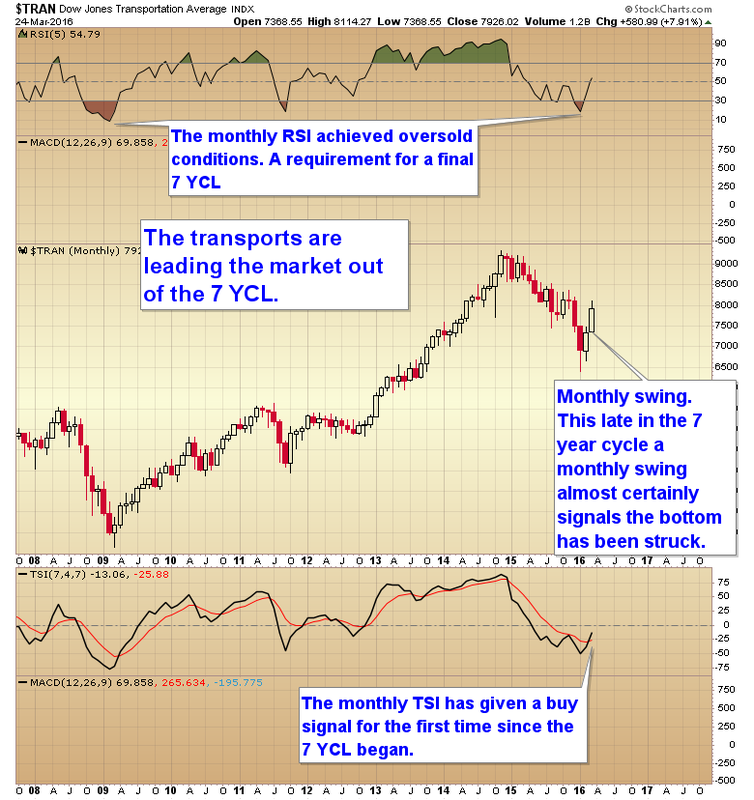 Cycles and sentiment are tools that anticipate when a bottom is about to occur. They aren’t perfect timing tools and sometimes I will be early and have to weather a drawdown, but they almost always get me in “close enough”. The technicals only crowd never catch these turns because they use lagging tools. By the time that crowd recognizes the move it’s about over and time for a correction. This is the crowd that “buys the breakout” and then gets sucked down into a correction ultimately losing money even though they have the correct trade. The buy high, sell low traders. I try to do things differently. I want to buy low, and sell high. William O’neal, Jack Schwager, Marty Schwartz, Ed Seykota and a few other Break out/trend following millionaire traders would disagree with your assumption all traders who wait for break outs/ confirmation are losing money. You never used to be so one sided biased in your analysis Gary and although you usually have a pretty great view of over all economic/market views, ,the tunnel vision, cant be wrong, is a sure way to lose money, while not disagreeing with your views per say I do have issues with your chart interpretations. This chart has a different perspective for the near term, but anything is possible. Markets can stay overbought or oversold longer than one can stay solvent. What I keep trying to tell you is that markets have evolved since those traders made their fortunes. Everything in the world evolves and that includes financial markets. The things that worked in the 80’s and 90’s don’t often work in modern markets. The IBB is not the biotech index, its an ETF, a basket of biotech stocks and carefully selected you might add. The biotech index is $NBI and is currently still under its 50d ma which is still currently under its 200d MA which in all circles classifies still in bear market. You may be right on the trade, not saying one way or another, but to assume you cant be wrong and have no need for a confirmation of trend change is pure vanity. Its sitting on support of 200week MA which is 50% retracement out of 2011 low which should be decent support so we’ll see if that holds and move up to retest the breakdown point is always a possibility. When did I guarantee I can’t be wrong? I’m giving you my opinion based on cycles analysis, sentiment, fundamentals (global QE and negative interest rates) and the current COT levels. So you warn folks on not shorting gold most of March. Guess what, it would had been a very profitable trade. It would have been a massively losing trade shorting the baby bull just like I warned. Now that the total commercial short contracts have gone above 300,000 the odds are better to short gold. That being said I almost never waste my time selling short. Markets go down differently than they go up and more often than not one loses money on the short side, even in bear markets. When I think it’s time for a sector to go down I just go to the sidelines and protect my profits or move my money to a sector that is starting a move up. To have made any money shorting gold in March you would have had to pick the exact top (never going to happen) and if you did you have made a grand total of 4.6%. Interesting S&P earnings chart Gary..This is of forward S&P 500 earnings. In particular the 96,97,98 bubble phase..
Based on that chart we could have a long way to go, especially if we are heading into a QE driven bubble phase over the next 2-3 years. Are you going disappear never to be heard from again if I turn out to be correct? Or will you be man enough to admit you were wrong? Before Al banned me at Kereport I noted that Doc would be wrong on his call for the dollar to go lower. it turned out he was the perfect contrarian signal as the dollar bottomed on that very day he made the call. This is why I keep stressing you need more tools than just some charting software. The charts never spot these cycle bottoms…or tops for that matter. Why were you banned out of interest? I’m not really sure. Al let the trolls attack me for two years. They would just make crap up to make me look bad.Then that nitwit Avi Gilbert started his nonsense so I defended myself and I guess Al didn’t like me putting down his new boy. His latest call was to go long miners after he missed the rally. Now he wants to go long after the miners have already rallied 90%. Not a very smart call IMO. I said so on the blog and the next thing I’m banned. Oh well everyone knows my record. They know I’ve been calling the stock market perfectly for years and I was the only one who caught the bottom in gold and oil. If you want to trade off of emotions with a perma bear bias go to Ker. If you want to make money by trading with real tools and an unbiased approach you come here. That’s very unfortunate. I really enjoyed listening to you on that program. I found Gary on Al’s site .. and Gary has been all class in my book .. Al lost all my respect and I don’t go on his site anymore. There is a down sloaping trendline for RSI-MACD indicators for the Biotech chart that Gary showed us above. Many analyst called a bear market last year when we saw a lower top coming in 30days later in May for Europe indices. Do US markets has the power to go against all other markets? Some say China is first to end the bear market. I think US needs a massive QE to break the initiated bear and that decision is not in place yet, so it’s dangerous to call a bottom in Biotech imo. Yes there is plenty of room for an uptick, but then it will roll over again, if continued tapering. Ok, Gold this was not a baby bull, it was just another bear rally. Yes we are getting closer to the end of the bear but we still got x years left in it. However there is plenty of cash to be earned taking advantage of the roller coaster ride in miners. May Elliott Wave chart indicates we will most definitely brake $1040, not by much, but we will see a new low for Gold in 2018/2019! Exiting week coming up, will I be released from prison? I’ve been in jail for almost 2years now due to the ministry of Quebec-Canada. No Gary this is not a prison with steel bars, it’s an abstract mental-financial prison with golden bars. If we get a permission to start production next week I could double my portfolio value in less than a ten days, I am talking about Gold Bullion Development. First off I want to say that you are a skilled trader reading indicators and COT reports and such. You work hard and you have had many great calls lately, but you are missing the bigger picture in Gold. This is not a baby bull. It’s just another bear market rally, and I think the rally is not over yet. We will see Gold at 1450 before the last finally low kicks in. I don’t know about oil, but for Gold, no many analyst called a midterm low in August and December. At least the guy’s I follow in Sweden and Europe. What tools are you using Stefan to base your call on? I think it is a baby bull. If it was just another bear market rally then it would have done like every other bear market rally and failed to make a higher high. There is no such thing as a baby bull. Not sure what that is even supposed to mean. It sounds kind of silly actually. Either its a new bull market or its not. Gary, some says that COT need to look at SP, not ES. SP is for position traders, ES for day trading. Hence the latest cot is bearish. I know you mentioned need to include ES as ES is more popular. But this SP for positioning seems hard to ignore. I wonder what’s your counter argument? I’m not sure what you mean by SP. I’m looking at the combined large and emini contracts for the Dow, S&P, Nasdaq 100 and Russell. SP meant big SPX futures. As I said before, most of the volume nowadays is in the emini contracts. So while 10 years ago one could just look at the large contract you can’t do that anymore. You have to track both and put more weight on what is happening in the eminis. I combine all the index contracts and put special emphasis on the NDX as it has been the most accurate for short term timing. Like I said, markets evolve. Those that don’t adapt with them go extinct. Inflation it is , foward we go!! If the current rally is topping out here, then it would be confirmation of a 3rd lower high. Don’t see how that is compatible with a “new leg in the bull market” theory. We will see what happens in the next few few weeks. MACD is just crossing over – so short the SPY here, and put a tight stop on the recent high. Great risk/reward for a short term trade. Could be plenty of downside if the rally peters out and we head back down. I can guarantee we are not topping out here. The rally still has to break the intermediate trend line before a final intermediate top can form. The first daily cycle may or may not top out here. But after that correction has run its course there will be another leg higher (and I expect that leg to test the all-time highs). Oil has to rally 100% or more in a year or less. I would also put one more condition on it that oil would have to start that rally from a higher level. Moving from $40 to $80 isn’t likely to crash the economy. But moving from $80 to $160 most definitely would cause a recession. so moving from 26 to 52 is far from being a problem correct? I don’t think a rally to $52 will hurt the economy. On the contrary it will diffuse the potential financial bomb in the energy debt market. Just biding my time waiting to scoop up XBI, hopefully in next two days and coinciding with the oversold stochastics on daily chart of S&P. If that doesn’t present, then I’ll take the oversold stokes on GDX as a signal to add to my miners, either way I should know around Wednesday or Thursday. I would wait till May before jumping back into the metals sector. It’s still too early for an ICL and sentiment is far from bearish levels yet that would call for a contrarian trade. I like to add when we are in the timing band for an ICL and when sentiment is extreme. Neither one of those conditions has been met yet. I’ll say again that it’s probably not a great time to bet on a rally that has already gone up 90% to just continue chugging higher. Price will either need to go sideways for a couple of months or correct back to the mean before the next leg up can unfold. This is one mistake that many traders make. They get mesmerized by a strong move up or down and automatically assume the move will continue immediately. Big moves need time to consolidate or correct before they can resume. Have the patience to wait for that to run its course. If the S&P recovers this week and makes a higher high it’s going to look suspiciously like a runaway move has begun with a corrective magnitude of 40-60 points. That would put it very close to prior top. Where does that coincide with your cycles? By the way Gary, I think you do a damn good job with the tools you use for market timing. We may differ on opinion on a few things here and there but youve always been a civil guy and have made some great calls over the years. Hi Gary, i’m new here, can you plz explain better the term of “corrective magnitude of 40-60 points.” ? SPX will run from here 40-60 points? If, and that’s still an if, the market develops into a runaway move then it looks like the corrective magnitude will be about 40-60 points. That would mean that all corrections would be no larger than 40-60 points and that would give traders an edge on where to buy during each correction. Thank for the clarification, how many points is the runaway itself? Gary, shall we still get into LABU ? I am not sure what is the message sent by the reverse split…what do you say ? As long as your time horizon is 1-3 years then I think anywhere in here is a good entry. If you are trying to time a perfect entry and can’t hold through any kind of drawdown then I’m not your man. I’m terrible at day trading. Keep in mind that LABU is a 3X fund and as such isn’t a long term hold. You will need to exit at the top of the intermediate cycle. Great! Thank you very much for your promt reply. Much appreciate it! So, if IBB and XBI are long term targets as you say 1-3 years, how long should someone keep LABU before exiting ? Until it looks like the intermediate cycle in stocks has topped. again, what is the time span for an intermediate top..
Gary…I assume you will give us a heads up when that time comes. I will make the call in real time for subscribers. To me, it didn’t look like anything much at all happened today. Of course it didn’t to you, Gary hasn’t told you what you think happened today. Gary: Biotechs are going to make new lows. I’ve said this a few times. It’s gonna happen. Sorry. well that settles it ted, thanks. Yup. You can have cookies now. An undercut low isn’t unusual. As I’ve said many times when big money starts to anticipate a bottom they will often manufacture a technical break so they can buy while everyone else is selling. That’s what happened with miners and I correctly identified it while all other analysts were busy selling their positions to the smart money. Fed Chair Yellen will speak tomorrow at the Economic Club of New York at 12:20 ET. may trigger a up or down move..